The Mövenpick hotel in Mactan is operated by the Mövenpick hotels & Resorts company, a well known Swiss based corporation. Established in 1948, they specialize in luxury resorts and currently manage 83 assets across the entire globe. 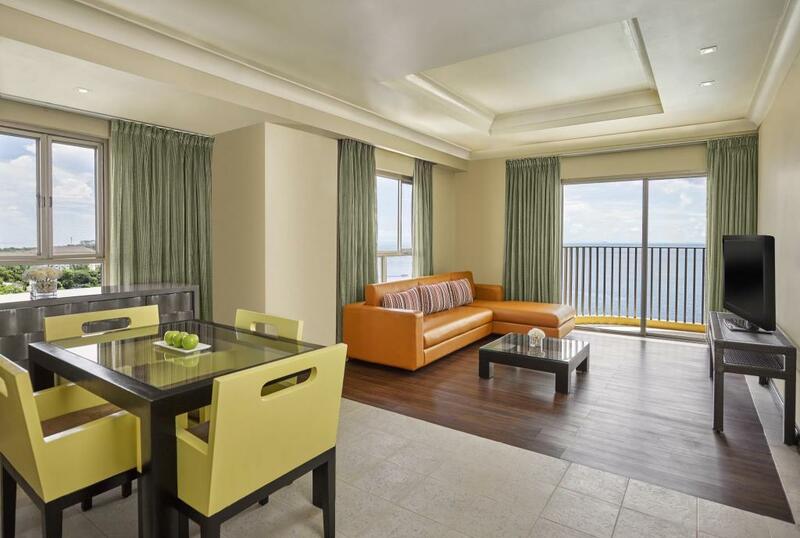 In the Philippines, Mövenpick have branches in both Cebu and Boracay. When looking for a 5 star resort in Mactan where you could spend a few days, Mövenpick should be high on your list of possible candidates. That is because this hotel offers a few significant advantages over its competitors. 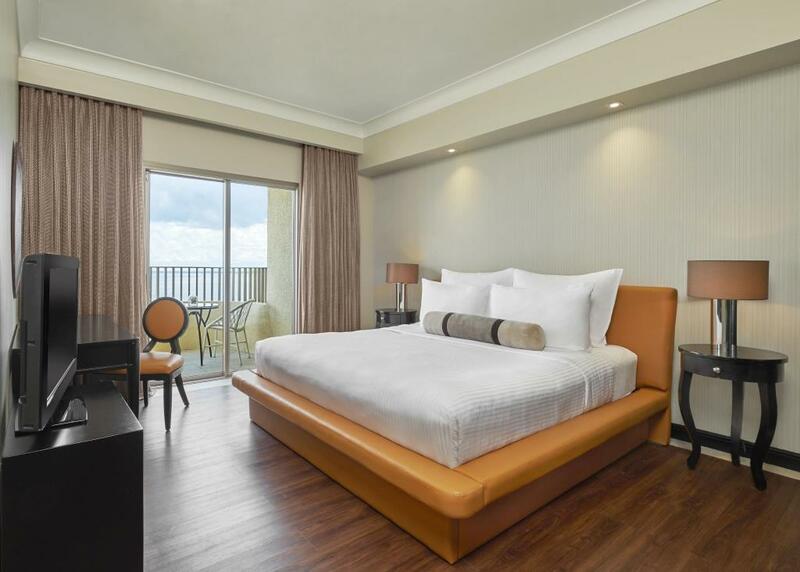 Above all, Mövenpick has by far the most competitive rates, with its non-suite room types (Superior and deluxe) being actually cheaper than most 4 star Mactan resorts. Furthermore, Mövenpick’s staff are extremely welcoming and professional. From the moment you set foot in this hotel until you check out, they will show a sincere willingness to make your stay a memorable one. Even though the hotel is quite large, with 245 available rooms on site, service is still punctual and quick, while highest standards are always maintained. The staff is very friendly and attentive. Still, with such a big resort it's hard to get personal attention all the time. This hotel is extremely well maintained - everything is clean and tidy. The whole vibe of the hotel gives a sense of high standards and attention to details. We found the rooms to be good. While the basic rooms could've been a bit larger, even these are stocked with high level amenities and clean modern furniture. The most beautiful and largest private beach in Mactan. The pool is also quite large and is clean and nice - but it can still get a bit crowded at certain times. Good location for those who want to spend most of their time inside an all-inclusive resort. The hotel is a bit far from other Mactan attractions. The resort's rates, especially for the more basic room types, are extremely fair. In fact, there are 4 stars resorts in Mactan who charge more than they do! It's without a doubt the best value for money option for those who seek a luxury all inclusive experience in Mactan. When we first set foot inside the hotel, we were immediately overwhelmed by the size of the entrance and parking area. It can be a bit intimidating, as you need to walk a considerable distance to reach the front desk area, giving you the feeling this is a really huge property. However, once we got to the reception and had a tour of the facilities, we realized the hotel is actually very well organized and reaching any point in it is very easy. Another thing that immediately struck us was the clean white design, with a distinct Mediterranean influence. This gives the hotel a very distinct and unique look, which sets it miles apart from the ordinary resorts you usually see in the Philippines. 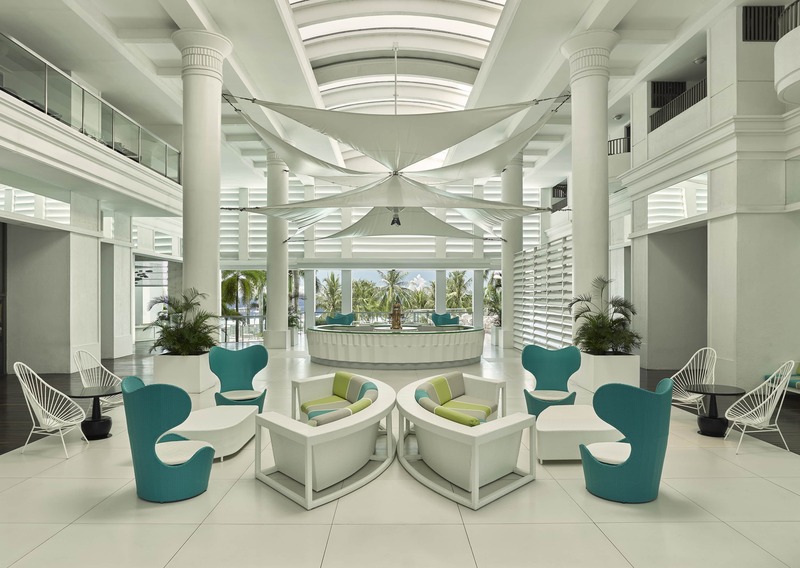 You immediately get the feeling this place is maintained at the highest standard imaginable, and the unique interior design gives a special twist to the island resort vibe. That said, to some this ultra modern and slick look & feel might seem to clinical and not homely enough. 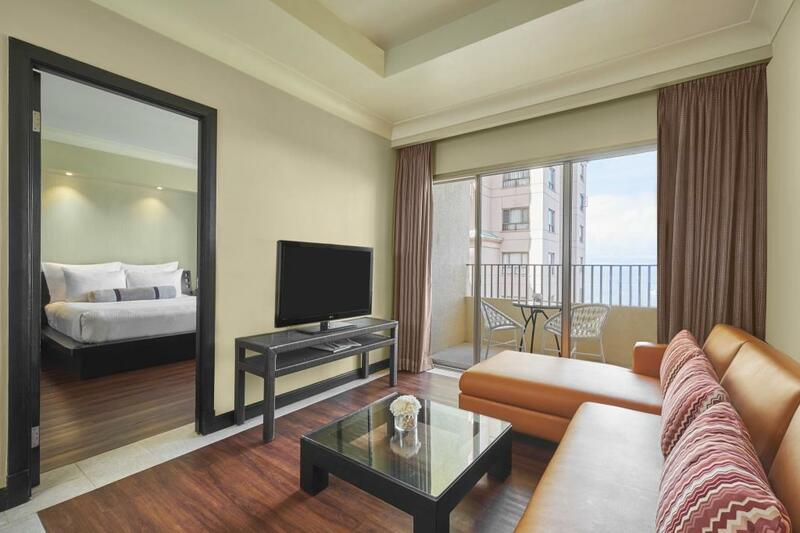 All rooms are furnished in the highest standards – beds are new and very comfortable, a large TV and a nice spacious seating area as well as a private balcony. The rooms all have hot and cold shower, air conditioning, a fully stocked mini bar, free WiFi and an in-room safe deposit box. All in all, even the most basic accommodation type will surely be sufficient to make you feel like you reached paradise. Mövenpick is that type of resorts in which once you book your stay, there isn’t really any particular reason to step outside of the hotel premise. 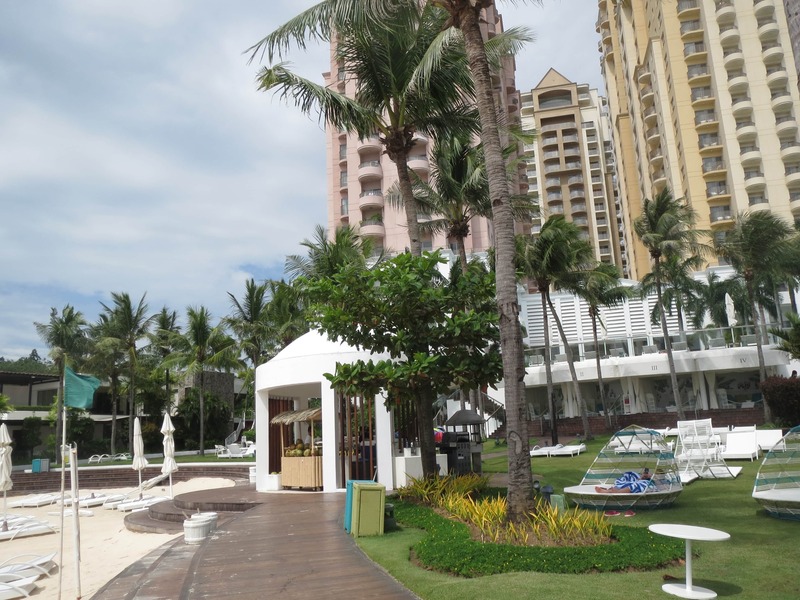 There are 3 restaurants and a bar area by the beach, as well as a very large swimming pool. On top of that, you can find an endless list of activities offered by the hotel – such as a kid’s playground, games room and a house reef where you can try out snorkeling, kayaking and even extreme water sports such as parasailing, kite surfing or jet skis. Their spa is also highly professional, offering an extremely wide array of treatments from expert therapists. As with all 5 star hotels spas, the prices are extremely high though so keep that in mind. 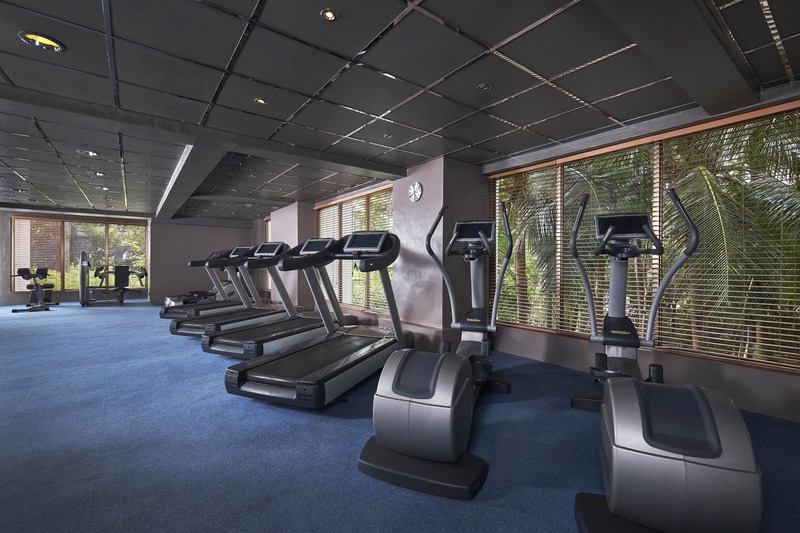 The spa area also includes a gym, 2 saunas and a hot tub – all are free to use by the hotel guests. 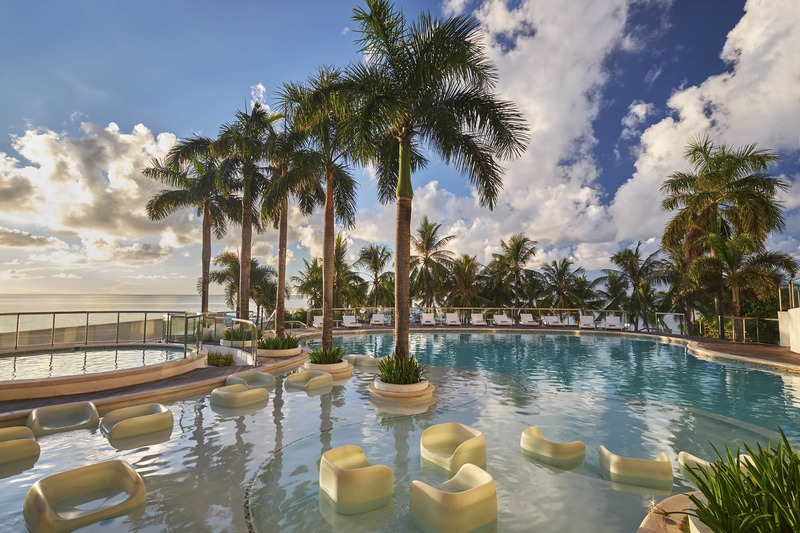 Add to that the large beach area, one of the best private beaches in Mactan, and you’ll see exactly why the Mövenpick provides the ultimate all inclusive experience. 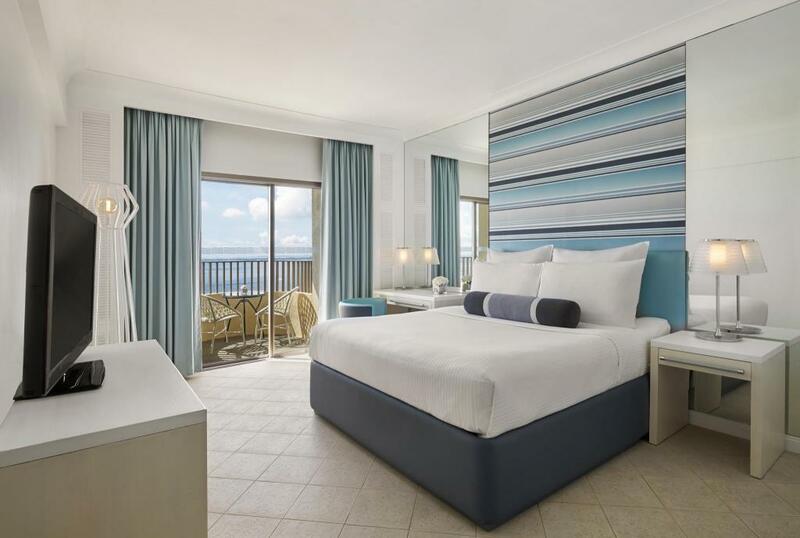 Mövenpick’s location is also pretty good, as it’s far enough from the island’s center to be considered quiet, but nightlife venues are still not so far away. It’ll take roughly 20 minutes to get to the hotel from the airport. Mövenpick don’t provide an airport pickup service, but you’ll get it for free if you book a Cebu package through us. As mentioned, Mövenpick provides endless activities and attractions to its guest during the day, so leaving the hotel isn’t really needed, and its relatively remote location shouldn’t bother you too much. Being one of the largest and most popular resorts in Mactan, it's no problem to collect extensive feedback from people who stayed at the Mövenpick resort. The fact this resort manages to maintain a very high rating and client satisfaction shows the level of service they provide, as well as their consistency. Tripadisor features no less than 2480 different reviews of guests. Out of which, 51% rate it as excellent, while another 30% say it was very good. only 6% of guests had a below average experience, with the main complaints being the price and size of their rooms. Booking.com has 1225 reviews to go through, and again most of them proved to be very positive. 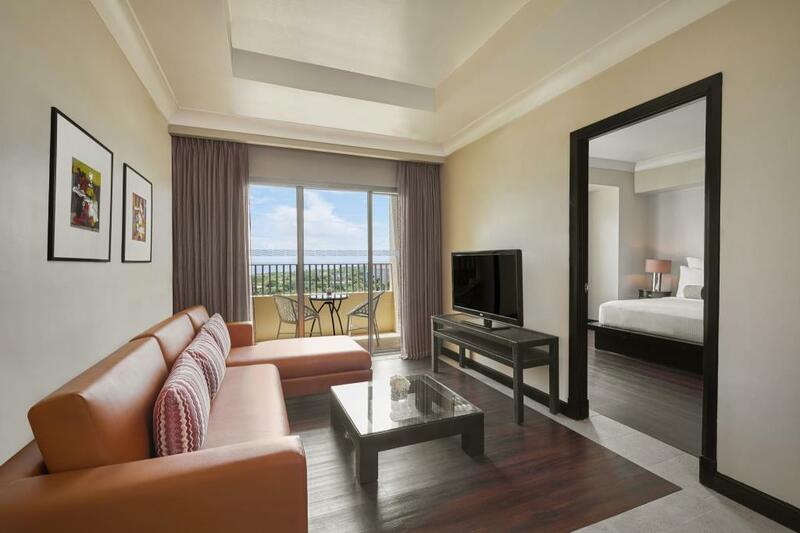 An average rating of 8.3 places Mövenpick as one of the top Mactan resorts. Guests are praising the location and service, while some complain about the hotel being crowded and the pool too small. We also read through all 1684 reviews featured on agoda.com. The hotel was awarded top choice of travelers to Mactan in 2016 - and boasts an excellent average rating of 8.1. Here, people usually praise the service and the Ibiza night club, as well as other in-house activities. When night comes, Mövenpick actually offers one of the best nightlife venues in Mactan – the Ibiza beach club. Walk in visitors come in especially from the city to enjoy the live shows and award winning cuisine. Hotel guests are given priority, but still you should make sure you book a table as early as you can, since the places is usually packed. The party goes on until 2 in the morning, with music being predominantly pop, dance and Latin. To summarize, Mövenpick is a perfect choice for families with small children, as well as couples who are looking for a romantic indulgence. 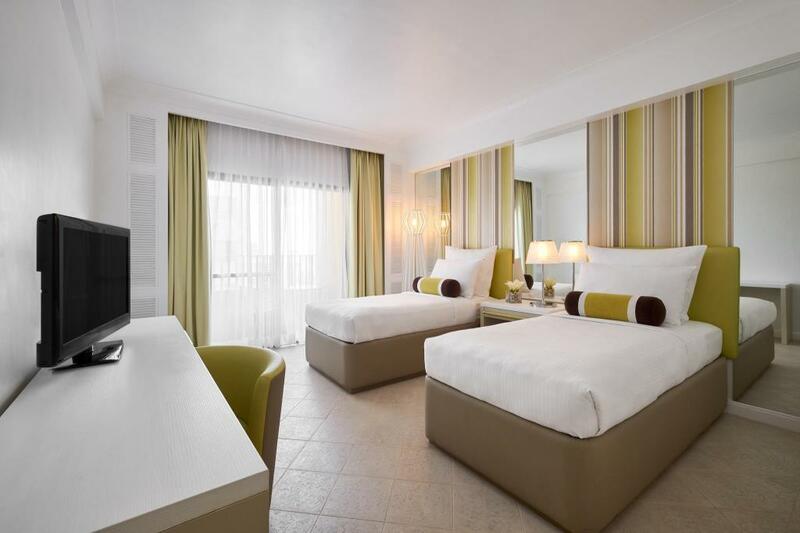 When it comes to Mactan 5 star resorts, the Mövenpick hotel truly represents the best value for money option. You’ll get a world class experience in a luxurious setting, with your own private beach and beautiful bedrooms for a highly competitive price you won’t be able to find anywhere else. These suites are basically 2 interconnected Ocean View suites. They easily accommodate 4 adults and 2 children, but extra guests can be added for a small charge. You’ll have 2 separate bath and toilet areas, as well as the best possible view of the ocean from your window. The suites room are generally good for 2 adults and a child, but one extra bed can be added for an extra charge. 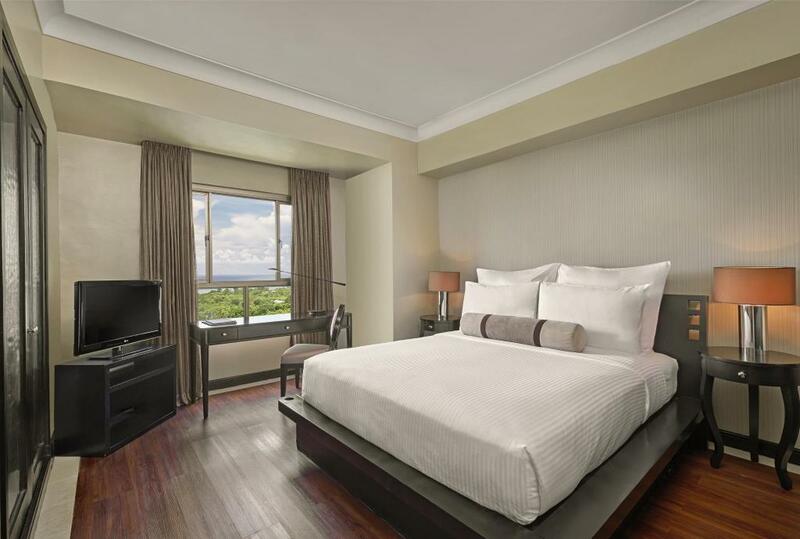 the room is 48m2 and comes with either 1 king size bed or two queen size beds. 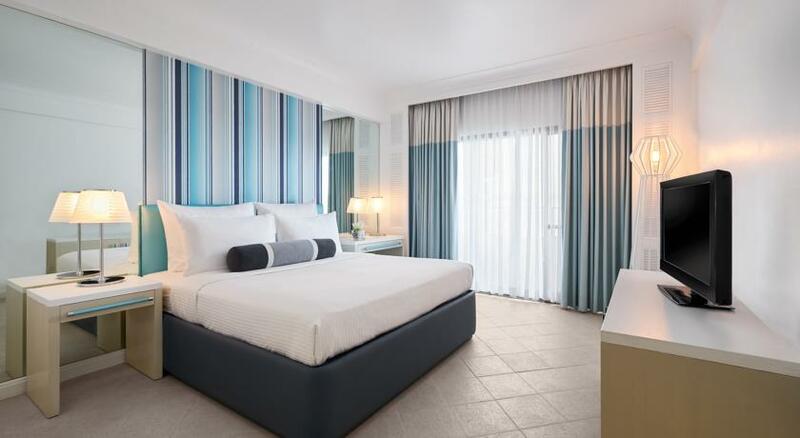 Prices vary depending on suite type, with courtyard view being the cheapest and Ocean Front the most expensive. 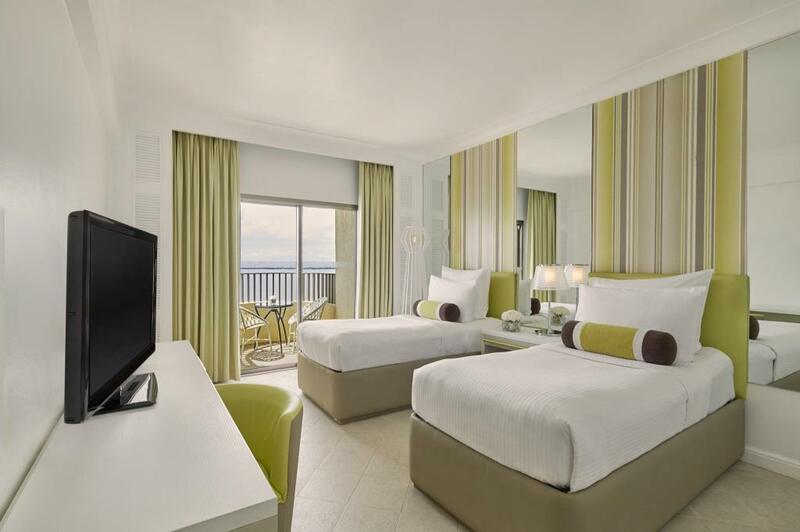 These rooms are exactly the same as the superior rooms, only they offer a view of the Ocean as well. Room size and amenities are all the same. 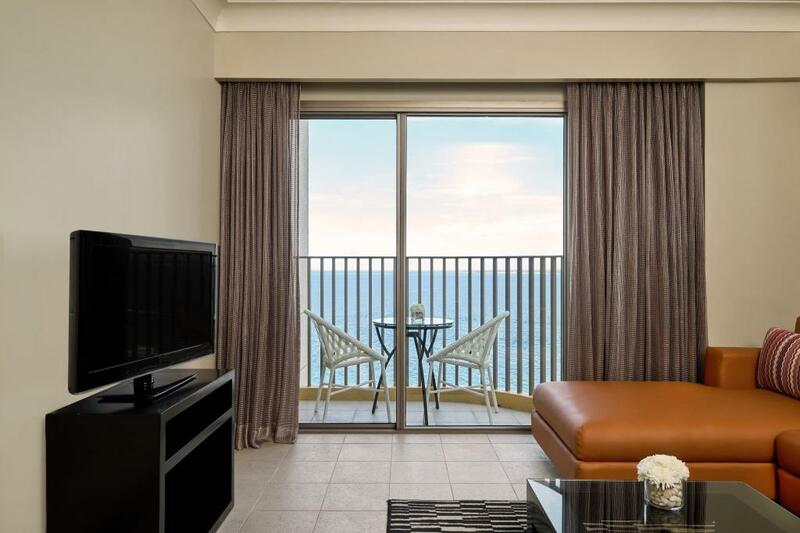 Keep in mind some rooms only offer a partial view of the ocean, so we’ll let you know in case only these are available before finalizing your booking. The Superior room is the cheapest one available, but still provides a feeling of luxury and class. Its size is 33m2, including a private balcony and a separate bath and shower area. 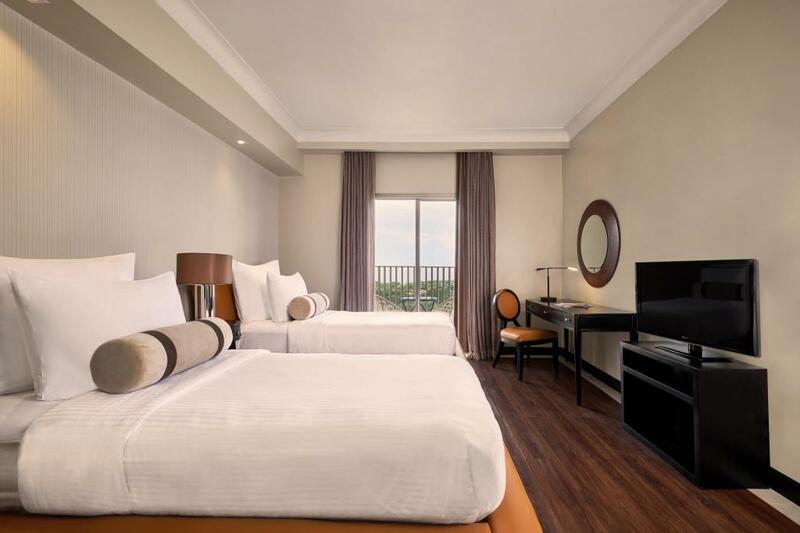 The room is good for 2 adults and 1 child, and you can book it with either a king size bed or 2 queen size beds.